A friend called me one day to tell me that his H.S. 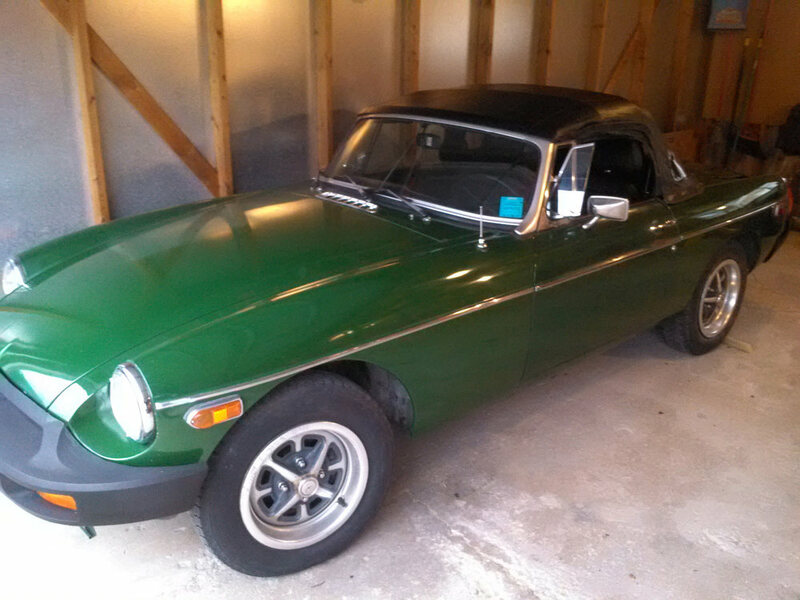 buddy's dad had a 1977 MGB in the garage since 1991. The car had some sentimental value as his dad obtained it from an estate sale when his brother (original owner) passed. It was driven, mostly for fun and eventually put into storage. Now after sitting for 24 years, the family decided to let it go. Overall the car was solid. It was time to be reborn. This MGB was indeed all original w/only 56,110 miles. I have invested some time & some $ into the motor since time took its toll, now it runs beautifully! Due to the great method of storage, the MGB is completely solid w/minor surface rust on the doors under the trim. The undercarriage looks great. The interior was kinda stale so I replaced it all. It has both tops (hard & soft) and covers to go with them. I was told to leave the vehicle to its original "unrestored body" to ensure that it has never been restored, most collectors prefer it that way. I'm a bit of a big guy at 6'02" and it's not easy for me to drive so I decided to put it up for sale!